Dr. Wang is actively involved in developing strategic alliances and critical collaborations with international organizations in both academic and industrial communities and working closely with the Office of Technology Transfer at various universities to facilitate the protection and commercialization of NFCR-sponsored intellectual property (IP) through patent filling and licensing. Dr. Wang has extensive experience in scientific program management, strong capability for technical and financial due diligence, and broad knowledge about early-stage technology evaluation and development., Dr. Wang has previously served as Chief Science Officer overseeing all the aspects of NFCR’s cancer research programs and research initiatives, which is operated at 9 discovery centers and 30 plus laboratories in universities, research institutes, and teaching hospitals in the US, Germany, and China. Dr. Wang also serves as the Chief Operating Officer for the Asian Fund for Cancer Research (Hong Kong, China). He is actively involved in identifying collaborative opportunities so that cancer researchers from Asia can work closely with scientists from the U.S. and Europe to maximize the utilization of resources. Dr. Wang received his medical degree from the Second Military Medical College in Shanghai, China, his Ph.D. in molecular biology from Kyoto University, Japan, and his MBA from Penn State University. 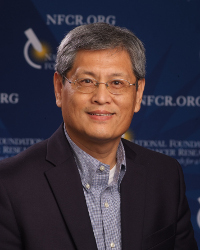 Before joining NFCR in 2002, Dr. Wang had worked at the University of Pennsylvania as a Research Fellow, and at a leading technology transfer company British Technology Group (BTG) as a Senior Business Development Manager for both the Oncology group and the Genomics & Proteomics group.